Because of the loving guidance of his Tuscan grandmother, Roberto Bernardoni has become a natural-born chef who has been able to live out his dream as an artist who creates memorable cuisine for others to savor. He possesses a great passion for his art, which he credits to watching and helping his grandmother in the family kitchen when he was young. It was there that he learned the secret to preparing great food. Within the walls of the their kitchen, young Roberto also learned to appreciate the wide array of ingredients that were available in Tuscany, and was trained to use only the freshest produce, herbs and meats when helping to prepare the family meals. The dishes he prepared were so good that numerous friends and family members began encouraging him to turn his love of food into a career. Somewhat surprisingly, however, as a young adult Bernardoni initially eschewed the idea of being a professional chef and began working for the city of Florence. But in 1977, at the age of 31, Roberto decided to leave his civil service job and open his first restaurant Ganino, which was a family business. Chef Bernardoni experienced a great degree of success almost immediately, as guests lined up on the adjoining sidewalk for one of the few seats available. He then opened L´Osteria delle Tre Penche with his current wife Patrizia. In 1991 Roberto moved to California, where he and his business partners fulfilled their lifelong dream of running a restaurant in the United States. At La Strada, which is located in the Gaslamp Quarter of San Diego, Roberto was able to offer his guests the same traditional Tuscan dishes that won him a following in Florence. 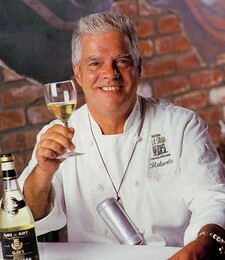 Eventually, because of his success in California, Roberto sold his restaurant in Florence, which allowed him to better focus his efforts upon the operation of their existing restaurant, as well as to go forth with his plans to bring San Diego its own authentic Florentine trattoria, Operacaffe. "Once a Florentine, always a Florentine.” Chef Roberto explains, “I may live in California now, but it´s what I learned to eat and cook with my grandmother, Alba, that defines who I am. For this reason I go back to Florence every six months to rekindle my romance with the flavors and scents of home." From the Penne Chiantigiano, a toothsome pasta dish made with premium Italian sausage that has been sautéed in vodka, garlic and fresh tomato juice to the Focaccina Cinqueterre topped with pesto, mozzarella cheese and shrimp, Chef Roberto Bernardoni imparts a touch of Florence into everything he prepares. Corkage Fee: 10.00 | Per 750ml bottle.